Pet Treater Box December 2015 Review + Coupon! Pet Treater is a new monthly subscription box for dogs that contains quality items for a fraction of the retail value. Box contents may include treats (made in USA or Canada only), interactive toys, accessories, grooming supplies, and more! For every box that ships, Pet Treater donates a toy, bag of treats, or blanket to an animal shelter in need. The Homespun Chics received this box for review. All opinions are 100% our own. This post contains affiliate links. Happy Howlidays! Beijing (a.k.a. Beeba) has been a good little girl this year and definitely deserves some special gifts from Santa Paws! Pet Treater has made my life a whole lot easier by sending a huge box filled with festive doggy treats! Beijing and the kitties have their own Christmas stockings at our house (so they’re a little spoiled). I love filling their stockings and finding the perfect presents, however my budget and “free time” can get a little tight around the holidays. Our Pet Treater box came packed with quality doggy items that are perfect to use at Christmastime! 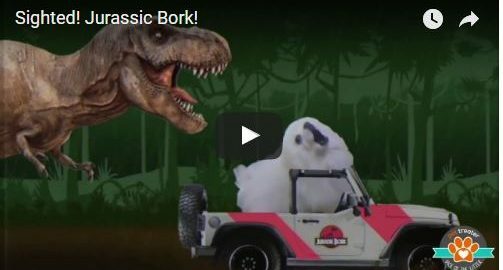 Affordable, practical shopping for our sweet pooch that gives way more bang for the buck! Pricing: $34.99 for One Month Only (does not auto-renew), $24.99 for Month-to-Month, $22.99 for 3-Month, $21.99 for 6-Month, and $19.99 for 12-Month. *Consult Pet Treater’s FAQ page under When and how does Pet Treater ship? for more info. “Flash Sale” items (available through website) ship usually within 24 hours. Flash Sale Items: A featured item is displayed at the bottom of Pet Treater’s Home Page. You have the option to purchase the flash sale item for a discounted rate directly on the site OR add a subscription to your order and the item automatically gets shipped with your box for free! *Enter this code at check-out to receive a FREE pet bed with your first subscription box! The bed size depends on the size of the dog you selected for your plan. If you set up multiple plans for your household, you’ll receive a FREE pet bed with every plan! We LOVE Christmas and were so excited to see Pet Treater‘s December box filled to the brim with holiday goodies! This month’s letter is a holiday survival guide for Beijing with tons of doggie do’s and don’ts to help keep our furballs off the dog shaming sites! This was very informative for Beeba and made me giggle. Do – be prepared for something called a “sweater.” Humans love them, and will try to put one on you, too. Don’t – panic. The sweater will make you feel paralyzed, but you are not. It has no powers, and is meant to be “cute.” While demeaning, it does keep you warm and usually results in extra comments on how adorable you are, which usually means extra treats. 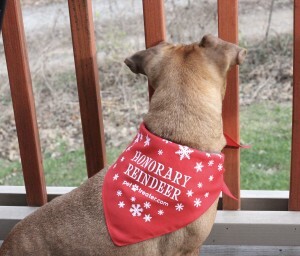 Honorary Reindeer handkerchief – Value: $5.00? This is the first thing we saw in the box and it is REALLY cute! Aahh! I love that Pet Treater had these specially made for all of their pups this month! Yes! More chewy treats! I love these full-size bags. We now have more than enough treats for Christmas, which is perfect for sharing with our fur-nieces and fur-nephews! Nature’s Recipe does not list the country of origin on their products unless the items were made outside of the USA. (I looked this up after I couldn’t find any indicator on the package.) This bag has a “best by” date of 10/25/16. My mom’s dog, Rocket, has a chicken allergy, so these venison treats will make the perfect Christmas snack for her pups! Paper Craft Holiday Cards, Photographic Pets (12 count) – Value: $10.00? I am so excited to receive a 12/ct pack of holiday cards for my human Pet Treater gift! I handwrite personal messages inside cards and attach them to presents that I give and also mail letters to friends and family that I can’t see over the holidays. These puppy cards are irresistibly cute and will be perfect for sending some love over the holidays! The inside reads, “Wishing you all the splendor of the season.” Typically, I prefer blank cards to write my own sentiments, but I can definitely work around short text like this! Huge WIN! 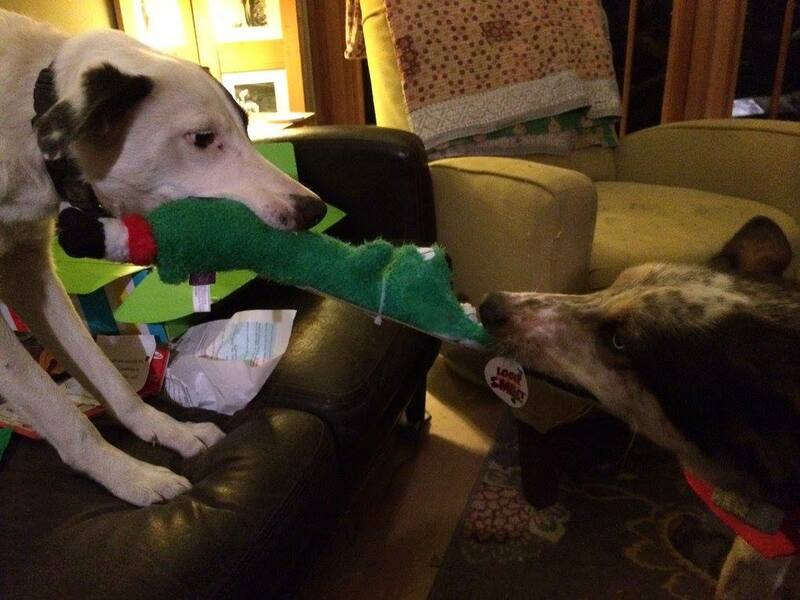 Christmas Sheep Dog Toy – Value: $5.00? This toy did not come with a brand mark, however the little tag on his toosh states it was distributed by CVS Pharmacy, Inc. Typically this means it was made under the exclusive store brand, Bargain Buys, however I am not sure. Either way, this is a super cute fella that did not make it into the stocking stash! Beeba had quite enough of my hoarding and decided to take matters into her own hands! This sheep has a standard squeaker inside, and I am surprised to report that Beijing has yet to rip it out! She has carried this sheep from room to room and even goes to sleep with it! Seriously cute. Merry (early) Christmas, Beeba. Your friends at Pet Treater love you very much! This is just the cutest little card and it even comes with an envelope! Beeba does not do well with rawhide, though she always seems to get her paws on one every Christmas Eve at nana’s house. Crunchkins are designed, printed and safely tested in the USA, however the rawhide comes from Thailand. Each card is made with 100% rawhide & non-toxic ink. Beeba will be gifting this to her fur-cousins on Christmas Eve! December Pet Treater Box Total Value: $66.17!!! I can’t speak enough about the VALUE of these boxes! I am floored by the heft and quality of the items we receive each month. Not only was I able to almost completely fill Beeba’s stocking using only items from this month’s box, but we also had enough to gift to our extended fur-family as well! I was really excited to see the holiday-themed curation and felt everything was extremely usable and giftable! Our sweet pups cost us quite a bit of money over the years (and are worth every penny), so why not help yourself out and only spend $25 each month to get a HUGE assortment of goodies sent straight to your home for your pooch to enjoy! Don’t forget, if you want to grab a FREE pet bed with your first month, click this link and enter the coupon CHICS-BED at check-out! You’ll also get the bonus “Flash Sale”* item added to your first box as well!! !